Liquid desiccant systems are often the preferred choice for challenging process dehumidification needs, for applications where high volumes of precisely conditioned air are needed for food processing, and for large-scale digital circuit manufacturing operations. When comparing desiccant systems, careful consideration and evaluation must be given to capacity and efficiency measures. Desiccant systems can be rated in terms of water removal (lbs/hr), airflow capacity (cfm), or cooling capacity (tons). Currently, no industry accepted methods exist for calculating a desiccant unit’s coefficient of performance (COP). And, desiccant systems cannot simply be substituted for alternative cooling systems on a ton-for-ton basis. Conditions and requirements can vary considerably between sites, so it is essential that each application be evaluated separately to determine the optimum system configuration. Consult equipment manufacturers for more information about evaluating their equipment. Desiccant dehumidification can help reduce or eliminate excess moisture and related problems in the building environment. The following case studies demonstrates what happens when gas technologies are applied to real-world situations. 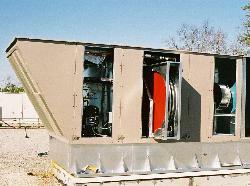 U.S. Army depends on natural gas desiccant wheel dehumidifiers to maintain proper atmosphere for sensitive weaponry and systems.